Edwin Lambert is an accomplished man. He spent six months in the Antarctic, he ran a nuclear power plant and worked as a probation officer. But one of his biggest accomplishments has been his adopted son. Lambert, now 81 years old, adopted his son, Daniel, in 1978. He and his wife were foster parents to newborn babies. Their son was born three months premature and exposed to drugs in the womb. He required three brain surgeries over the course of the next four months. Now Daniel has a life of his own with two children and a wife, but due to his brain injuries, he receives Social Security disability payments. He also qualifies for federally subsidized housing, commonly known as Section 8. Section 8 refers to the portion of the Housing Act of 1937 that established a program that would pay landlords to house tenants who met certain requirements. Wright is a well-known landlord in the city of Tempe, and is far from beloved by many of his tenants. A simple Google search of his name will pull up plenty of hits about his business, Rentals Tempe. Currently, its Yelp rating sits at one-and-a-half stars. Most of the reviews follow a common thread: Don’t rent from Timothy Wright. Wright has garnered a reputation in Tempe for his willingness to evict or even sue tenants. The law firm he frequently employs, Hull, Holliday and Holliday PLC, promotes itself as “Doctor Evictor” . Emails, phone calls and texts by the Arizona Mirror to Wright have gone un-returned. In 2003, he was even the subject of a class action lawsuit brought by multiple tenants claiming their leases were illegal, among other allegations. Wright settled out of court. Wright owns more than 100 properties, most of them in Tempe. A dozen of the properties are are eligible for subsidies from the government. Lambert knew none of this in 2014 when he found a place for his son right next to Hudson Park, south of ASU’s main campus, that would take Section 8 vouchers. The place wasn’t perfect, but it was a home, and one that his son could be proud to live in. Little did he know that he’d be in constant battles with Wright for the next three years. In early 2014, Daniel Lambert and his family needed to move after discovering the home they were renting contained mold. Finding a place for four people and five pets that is also subsidized housing was proving to be a Herculean task. Finally, they found Rentals Tempe and Wright and his son, Timothy Wright Jr., assured them that they could get them into one of their properties. The first warning sign came during the application process, when Wright Jr. told Edwin Lambert that Daniel failed a credit check. Lambert said he ran his own credit check on his son later that day, and nothing negative appeared. Nonetheless, they moved forward with leasing the property. Edwin Lambert ended up co-signing with his son and daughter-in-law, and gave Wright a $500 deposit. That $1,000 deposit would soon become the heart of a legal battle between Wright and Edwin Lambert. Once Daniel’s lease was up, he and his family moved out. Wright told the Lamberts that all the carpet needed to be replaced due to the smell of cat urine. They disagreed, but said that Wright could use the $1,000 pet deposit to cover the cost. Wright responded by saying that the deposit was for the “privilege” of having pets, not for clean up, as the contract dictated. So, Edwin Lambert replaced all of the carpet, about 1,000 square feet. He even painted the entire house and repaired loose electrical outlets. The house was spotless. Wright returned the security deposit in full, but kept the $1,000 pet deposit. He asked Wright to reimburse him for the $1,000, given that he spent more than $1,600 to replace the carpeting. Wright refused, and said his carpet vendor would have done the job for $500. So, Edwin Lambert did what most tenants can’t do: He took Wright to small claims court and he won when Wright failed to appear. The court ordered Wright to pay Lambert $1,000, plus interest. Lambert was ecstatic; he thought he had beaten the landlord that many were unable to beat. But things soon got complicated. Wright wouldn’t return Lambert’s calls or emails, and he wouldn’t pay up. So, Lambert tried to impose a garnishment on Wright. But Wright’s bank account has a collection hold on it, so it can’t be garnished. He reached out to the Phoenix office of Housing and Urban Development, which told him to speak to Tempe. Tempe wasn’t helpful, either. In one conversation with city officials, Lambert says he was told they didn’t want to anger Wright because they feared it would mean a loss of Section 8 housing. From March 12, 1998, to Jan. 17, 2018, Wright has collected $1,667,293.38 from U.S. Housing and Urban Development through Tempe for his Section 8 housing. Timothy Wright owns hundreds of properties in Arizona and some in California. 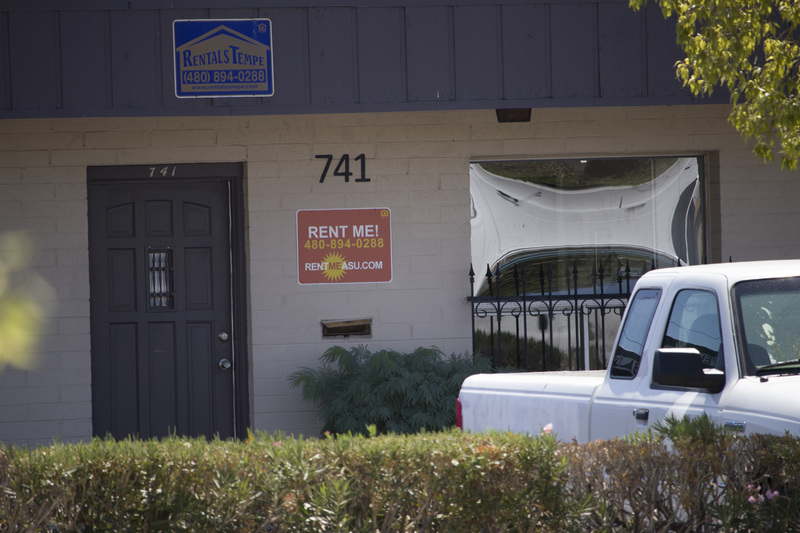 Most of his property is situated in Tempe, hence the name of his business Rentals Tempe. Wright is no stranger to controversy and legal battles. Volk has been an outspoken critic of Wright since the 1990s, and was involved in the 2003 class action lawsuit against him. Volk and Wright’s relationship has been the definition of adversarial. Wright has sued Volk for defamation and libel. Volk responded in kind with fake wanted posters with Wright’s face on them. But Wright is just a symptom of a larger problem, Volk said. “It’s the same as its always been, tenants get screwed,” he said. Volk has acted as a guide to those looking to fight back against what they feel is predatory renting practices. His organization’s website offers multiple guides to help people through the legal process and even has a section dedicated to Wright. But even with all the advice in the world, the deck is often stacked against tenants. Landlords hire attorneys, which tenants usually can’t afford. Many landlords are even friendly with the local court system or hire attorneys who are. Most tenants don’t know how to file motions or submit petitions, which can frustrate the court and lead to decisions that don’t favor them, Volk said. That’s what makes Edwin Lambert’s case so unique. His knowledge of the legal system aided him in winning against Wright, something that doesn’t happen very often. Mohammad Halloum did not have the same success that Lambert did. Halloum, 22, moved into a small Wright property in Tempe that was a storage shed which had been converted into a studio apartment. It wasn’t great, but to Halloum, it was home. He was studying at ASU and needed a cheap place to live and it fit in with his minimalist lifestyle. Halloum didn’t think to check out his new landlord on Google, something that he later ended up regretting. Halloum said Wright acknowledged that the place needed lots of work — the front door needed repairs, as did the interior walls, among other things — and he planned to do just that. The two shook on it, but Halloum didn’t get those guarantees in writing. The contractors Wright hired would show up unannounced, do shoddy work and then be fired by Wright. Some would stop working after learning that Wright was withholding payment. Twice Halloum’s power went out when the owners of the main house, whose backyard his studio shed was in, were evicted, and Wright would often ask him to pay the electric bill for the now-evicted tenants. Things were frustrating, but still somewhat bearable. Then Wright’s secretary left and Wright offered Halloum the job. He declined, and then the real problems began. “It felt like retribution,” Halloum said. Wright would be shorter with Halloum, call him frequently on restricted numbers and he began demanding rent be paid early. Halloum said he felt the change was because he refused to work for Wright. So Halloum started asking questions, learning more and digging around. He found out the main house was Section 8 and the shed in the backyard was in violation of the city’s zoning rules. Furthermore, representatives from HUD who came out to the property said it was not being properly maintained and called a palm tree in the backyard a “torch,” Halloum said. Wright did hire a landscaper after that, but he left halfway through the job telling Halloum that Wright was refusing to pay him what they agreed on. Halloum said he had reached his breaking point, and refused to pay rent until Wright fixed all of the problems. Then things got scary, he said. One day while in his residence, Halloum heard someone trying to get in. He assumed it was someone trying to break in, so he grabbed a shotgun and sat by the door. The man came in, was startled by Halloum and confessed he had been sent by Wright to evict Halloum. Halloum called the cops and filed a report. The Arizona Mirror sought the report, but police said that the reporting parties settled the dispute on their own, and no full report was created. Halloum said he did not settle the matter with Wright. Fed up, Halloum finally tried to fight Wright in court. Wright was attempting to evict Halloum, who thought that, with the photos of the decrepit property, he could win. But Judge Tyler Kissell told him he was paying a fair price for the studio apartment, and ordered him to pay what he owed in rent. Halloum said he was devastated and depressed after losing the case, but is still weighing his options. Things for Wright could be changing fast. Documents obtained by the Arizona Mirror confirms that the Arizona Attorney General’s Office is representing the Arizona Department of Revenue in an investigation into Wright. Wright filed for bankruptcy in 2016 and, in doing so, revealed that he owes the city up to $100,000 in unpaid transaction privilege tax. In an email to city officials, the AG’s Office surmised that the city was unaware of the bankruptcy and unpaid taxes. The emails also reveal that HUD reached out to Tempe after speaking with Lambert, urging the city’s housing authority to investigate Wright for what they felt were “egregious” and “questionable” charges. Emails also reveal that Wright’s behavior seems to be known to city staff, which has even caused some issues within the city’s housing department. One email from Tempe’s Housing Services supervisor urges employees to not say anything bad about Wright as it could be seen as a violation of the Fair Housing Act if they are seen to be steering people away from Wright, an accusation Wright made in a complaint he filed with the city in April 2018. There are also emails with stories similar to Halloum and Lambert’s. Renae Gonzalez told the story of a home her son and 6 other ASU students had rented from Wright. The home was already in disarray when they moved in, but things got really bad after a storm struck. A tree fell partially onto the roof of the house and Wright kept dragging his feet on getting it moved. First he said he’d fix it that day, and then days went by with no action. Gonzalez ’s initial email to Tempe Mayor Mark Mitchell and the entire city council didn’t receive a response for more than a week. Finally, the Mayor and City Council’s chief of staff responded, telling Gonzalez that Wright had told city officials he’d remove the fallen tree. The response also urged her to take the issue up with the attorney general, and even suggested she reach out to Volk’s group. “I am beyond surprised that after hearing about this slum lord, in fact one can confirm by simply Googling the guy, that the city would simply call Tim Wright, and take his word,” Gonzalez said in the 2015 email. Another email from one of Tempe’s Housing Authority employees shows they were aware of some of the ways Wright treats his tenants. “He is not going to let her back in the residence, not even to get her food,” Kathy Nugent, a city accountant, said in one email about a tenant evicted by Wright. Thank you for your reporting on this rental company. As someone who rents an apartment in Tempe and is looking to rent a home in the future, this article helped me dodge a bullet I wouldn’t have known to dodge. And also, I’ll be Googling every landlord and checking their BBB rating from now on! Tim is a crook in every way. I worked for him for a few months, and during that time he ripped tenants off right and left. On the top of that, I recently discovered that he doesn’t even have a broker’s license and I know that at least when I worked their neither the property manager or myself, the assistant property manager, were licensed and we were performing tasks that required one. I don’t even think he is legally allowed to conduct business as a property manager with out one, but we will see. I filed a complaint with the department of real estate so time will tell. I’ve a challenge that I’m just now working on, and I’ve been at the look out for such info.